We are a diverse and inclusive community of people who support each other in our spiritual journeys and work for positive change in the world. We’re seekers, attenders and members in the Religious Society of Friends. We are also known as Quakers. We are affiliated with Southeastern Yearly Meeting. All are welcome to join us for unprogrammed Quaker Worship on Sunday mornings. 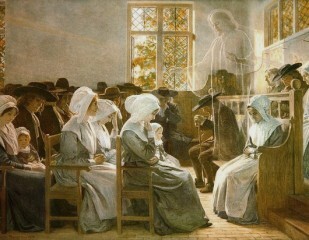 Quaker worship is based in silence, with no sermon, ritual, or music. After Worship, please join us for coffee and conversation. Worship begins when we are seated and quiet. No clergyman or minister presides and there is no set form or program. The Meeting for Worship is based on silence broken only by brief messages from those who feel moved to share with the meeting the inspiration and knowledge of the will of God that rises out of meditation and prayer. In the practice of silent waiting we find our spirits come more easily into fellowship with the Divine Spirit. As we wait in silence we become conscious also of fellowship with other worshipers. Every individual participation enriches the fellowship whether the person is silent or speaks. The Meeting for Worship in its highest sense represents the culmination of a week’s private prayer and daily living. So in a way, it is the summation of one week and the preparation for the week to come. The meeting closes with the shaking or holding of hands.